Yutong disposable plastic seals are molded through the plastic, compression molding plastic seals can be used at the highest temperature of 60 ℃, the lowest temperature -30℃ occasions. 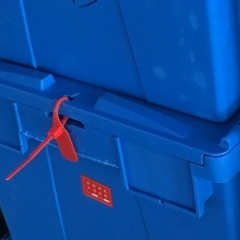 The use of plastic seals can be advanced Computer Management system for the entry and exit of goods registration, distribution, inspection, unsealed, reuse, cancellation and other aspects of supervision, fundamentally solve the traditional security equipment, illegal replacement, authenticity of the prison to do difficult, difficult to manage problems. such as plastic seals, metal seals, buckle-lock plastic seals paste letters and other easily copied traditional sealing products. Because of the characteristics of plastic seals above, it has played a very important role in the transport process, not only can realize the whole process of railway container transport monitoring, to ensure the effectiveness and safety of railway container transport, but also to reduce the work strength of staff, efficiency, and can be more effective tracking and management, Created enormous economic and social benefits.